Have you seen previews for The Big Wedding yet? If you haven't that is okay...I have a video for you. It looks hilarious! I am really excited to see this movie because I love Romantic Comedies and I REALLY Love the actors and actresses. Katherine Heigl and Amanda Seyfried are two of my favorite actresses. I adore them and can't wait to see them together in this movie. Throw in Robert DeNiro (who apparently gets slapped...a LOT), Robin Williams, Diane Keaton and Susan Sarandon and Wow...that is one heck of a cast. 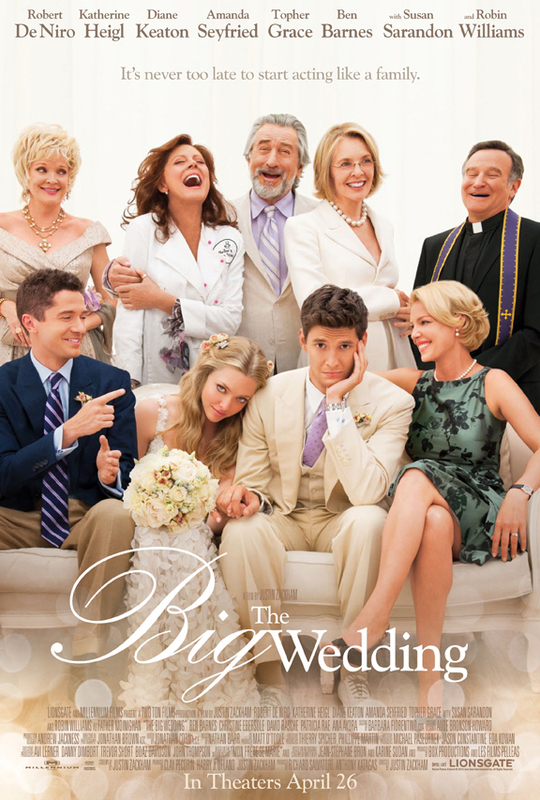 With an all-star cast led by Robert DeNiro, Katherine Heigl, Diane Keaton, Amanda Seyfried, Topher Grace, with Susan Sarandon and Robin Williams, THE BIG WEDDING is an uproarious romantic comedy about a charmingly modern family trying to survive a weekend wedding celebration that has the potential to become a full blown family fiasco. To the amusement of their adult children and friends, long divorced couple Don and Ellie Griffin (De Niro and Keaton) are once again forced to play the happy couple for the sake of their adopted son's wedding after his ultra conservative biological mother unexpectedly decides to fly halfway across the world to attend. With all of the wedding guests looking on, the Griffins are hilariously forced to confront their past, present and future - and hopefully avoid killing each other in the process. Screenplay by Justin Zackham. Directed by Justin Zackham. Guess what? If you buy your tickets now you can get Buy One Get One Free tickets!! 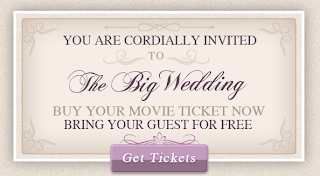 Just visit The Big Wedding's official site and click "Get Tickets". It will be $12 for 2 tickets which is BOGO (or at least a great deal) in most locations. Make sure you check to see if your theater is a "participating theater". I checked my area and all of the theaters near me were participating. THE BIG WEDDING opens nationwide April 26, 2013!! Thanks for sharing, I really want to see this movie! Another possible Mother's Day gift! The movie looks like we would enjoy it. We will try seeing it in one of our rare date nights. how cool! I will take my mom. This is totally my kind of movie! !